A company that needs to package their products have choices in which material they use for packaging. Traditionally companies could use polystyrene materials, which are commonly injection molded or extruded for packaging. However, companies are becoming aware of the environmental impact of polystyrene, such as the inability of the material to biodegrade. 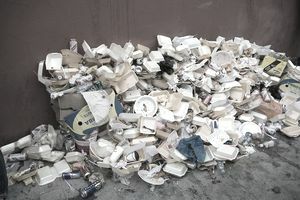 Polystyrene packaging is unable to be recycled and would have to be disposed of in a landfill. Therefore companies are looking to use recyclable and biodegradable packaging materials where possible. With starch-based packaging materials, the product is biodegradable but is not an inferior material when compared with synthetic polymer materials. Instead of using packaging materials made from synthetic polymers, a new material has been developed using polylactic acid (PLA), which is made from fermented sugars, usually from cornstarch. The materials made from PLA are biodegradable which is important for the environment. If disposed of correctly, packaging material made from cornstarch will break down into carbon dioxide and water within several months. However, if the material is not disposed of correctly corn starch based material will take longer to decompose, especially if there is no oxygen or light available. The corn-based packaging material is preferable for companies as the raw material, corn is sustainable, cheap, and easy to produce. Corn is the least expensive and most abundant source of commercially available sugar. Synthetic polymer materials are produced from petroleum, a non-sustainable item that can be expensive depending on the price of oil. Corn starched packaging does have some interesting advantages over synthetic materials such as a reduced static electricity. The PLA material can be made into a fiber or a film. There are a number of PLA grades that are available for commercial customers which can be used for a number of different applications. There have been issues with PLA materials that have caused some criticism of the product. Issues with Recycling – As PLA materials need to composted rather than recycled, like paper and cardboard, companies need to separate the PLA materials and the regular recyclable materials. Currently, there are only just over a hundred composting facilities in the US. Issues with Composting – Although PLA materials are able to be composted, the correct conditions must exist. If the material is deposited in a landfill without the proper oxygen and light, the PLA material may not decompose for decades. Issues with Usage – PLA materials can be used for many applications but this does not compare to the uses of the more common plastic polyethylene terephthalate (PET), which is used to make bottles consumers use every day. Packaging is important to protecting materials and companies will use the best material for the job. The advent of cornstarch-based materials has allowed companies to choose a packaging material that is good for the environment and still suitable for their packaging need. The issues with PLA are well documented but the availability of PLA packaging materials is the first step in reducing packaging waste and helping the environment. As supply chains become increasingly aware of the importance of moving toward sustainability, greener options like corn starch packaging are being recognized as more than just a public relations alternative. By making a shift toward sustainability, supply chains ultimately lower their costs because the raw materials needed to make corn starch packaging is cheap and easy to produce. The increased usage of corn starch packaging will bring its costs down further - and therefore will allow this greener option to become even more readily available.